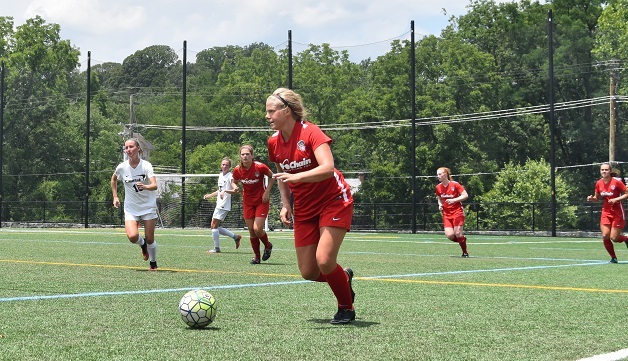 Boyds, MD (July 11, 2017) – The Washington Spirit Reserves capped off the Women’s Premier Soccer League (WPSL) regular season on Sunday, July 9 with a dominant 5-0 win over Virginia Beach City FC. The team finished the season with an unbeaten 6-0-3 record to claim first place in the Colonial Region and earn a spot in the East Division playoffs, which will be played the weekend of July 22-23 in New York. Maddie Huster led the Reserves with two goals and two assists in the regular season finale against Virginia Beach City FC, while Sadie Stark, Lana Spitler and Meaghan McElligott each found the net as well. Defensively, it was the fourth clean sheet of the season for the team. Over the course of eight 2017 regular season games, with the ninth game on the record not being played due to forfeit, the Spirit Reserves outscored opponents by a lopsided margin of 30-5. This marks the second straight season the Spirit Reserves have gone unbeaten in the WPSL regular season, as the side followed up on a 9-0-1 record in 2016. The team has not lost a regular season match in any competition for four full years. In 2014 and 2015, the Reserves posted undefeated regular season records in the USL W-League. The Spirit Reserves will kick off the WPSL playoffs on Saturday, July 22 with an East Division semifinal match-up, with a chance to advance to the final on Sunday, July 23. The winner of the East Division will advance to the WPSL National Finals, set for July 29-30.